The increase of overweight children worldwide is a serious health concern and there is convincing evidence that this may be partially caused by programming effects during infancy. Babies and infants can be programmed to become overweight and develop consequent metabolic disorders which manifest themselves later in life. 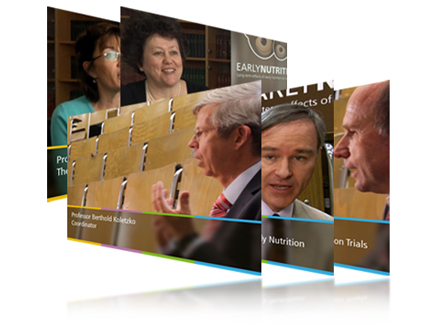 EarlyNutrition aims to foster the scientific basis for this programming effect and to fill the gap between scientific advances and their practical implementation into recommendations for everyday life. 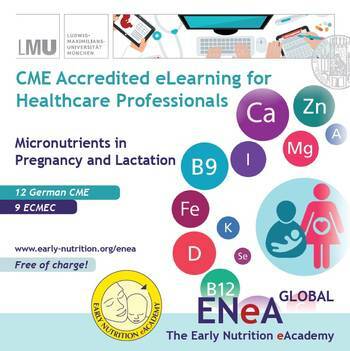 The Early Nutrition eAcademy has launched its new Focus Module "Micronutrients in Pregnancy and Lactation"! Click here to take a look at the comprehensive insight into micronutrients and their importance in pregnacy and lactation! This website provides information about the research project EarlyNutrition, which is funded by the European Union. Researchers from 35 institutions in 12 European countries, the United States and Australia have joined forces to study how early nutrition programming and lifestyle factors impact the rates of obesity and related disorders. The term programming effect refers to the finding that nutrition and lifestyle during pregnancy and infancy can affect a range of different bodily functions. These programmed changes in the body increase the likelihood of becoming overweight and the occurrence of associated diseases in later life. Such effects have been confirmed by earlier research by the FP6-funded Early Nutrition Programming project EARNEST.